Well it is slowly coming together with he new 5th wheel, who knew you could move things from one location to another so many times before you found just the right arrangement. And the poor ole motor home that we got rid of had accumulated so much stuff in the nearly 7 years that we are still sifting through it. We used to get near home about every year and always had the take home and bring back list. It seems now that the take home list was never long enough. We had another small water leak this past week n the storage bay that entailed taking every thing out and removing the panel to the water pipes compartment where after a week we still haven’t found the leak but it has stopped letting water into the area so I am hoping that it was left over from the leak we had when they installed the washer and dryer while at the dealer. At any rated I managed to sort through all the boxes in that area and placed them back in. Keeping fingers crossed that we do not have to take them back out again. Now to our gate guarding it has been rather busy here this week as they are back at the construction of the two pads for for 8 more wells to be drilled. Yep they are drilling four wells on each pad here. They have been averaging about 180 to 220 loads of cliche per day. The construction super said today that they were suppose to be completed by this Sunday. The Drilling rig move again this past week to another pad and have managed to get rigged up and drilling again. They have completed the surface run and have it cemented in. They are now drilling down to the point to turn Horizontal. 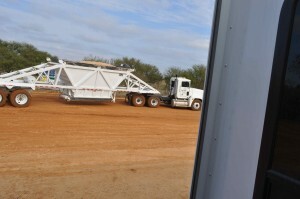 So with the Dirt trucks Pipe trucks and Cement trucks and crews it has been exciting. This entry was posted in Uncategorized and tagged Getting the 5th wheel lined up. Bookmark the permalink. Tags, do I see tags? Nope! Wow, how many wells are you guys going to have running at once? That could be a whole lot of traffic! They’re running a pipe line next to the RV tomorrow. So much for day sleeping! Oh Luke… I wish I could help you. It shouldn’t be too hard since we both have Word Press blogs. Let me think about it. I’ll try to send you something to help – I have no idea what, but I’ll give it some thought. 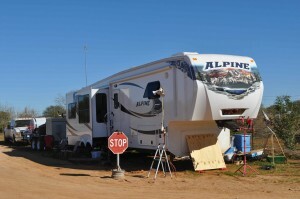 I see you have a new Alpine 5th wheel. How do you like it, what layout did you get? We are looking at the Alpines. They have a new one with the bedroom in the back with an outside door. The living room is up where the bedroom is. Just wish they weren’t so dang expensive.